I mentioned a post or two back that I wanted to work out how to make those gorgeous Out of Africa earrings by Isabel Marant. She can do no wrong in my eyes. In the picture you should be able to see how I made them. I used a eye pin, which is the piece of wire with a loop at the end, a length of heavier wire, a pair of pliers and some African beads. Basically the earrings are two pieces of wire with a loop at each end. The eye pin is silver and softer so I used that to fit through my ear. The other piece was heavier and the beads went onto that piece. 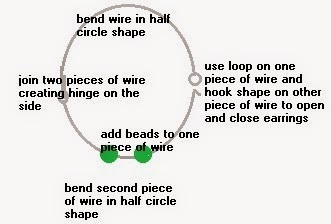 You bend the wire into two matching half circle almost half oval shapes. Then you join the two pieces of wire at one end to make a sort of hinge so they can open and close. At the other end I made a hook shape that fits through the loop. 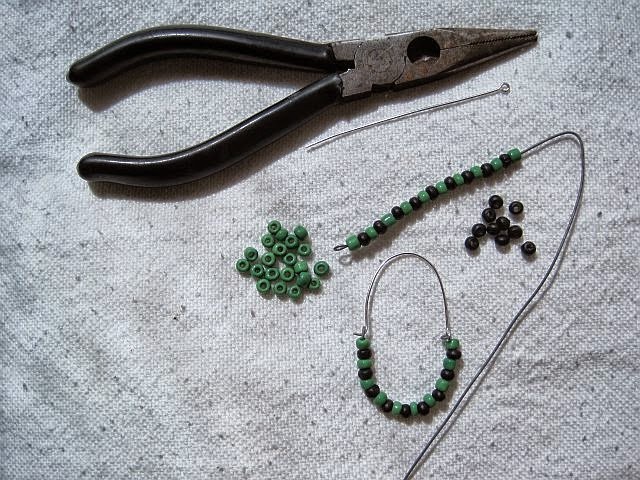 The wire is soft enough that the hook fits through the loop when you put the earrings on or want to take them off. Gosh, sometimes these things are so hard to explain and yet so simple. The Greenie Galleries at the top of this page show more ways to make your own clothing and accessories. How to DIY and not buy.